Esta excursión privada a Chiang Rai, a las tribus montañosas y el Triángulo de Oro es la forma perfecta de experimentar la belleza y la cultura de Tailandia. Visite la zona donde se unen Tailandia, Burma y Laos, explore el famoso Museo del Opio y aventúrese en la antigua ciudad de Chiang Saen, que se remonta al 1260 D.C. Eche un vistazo sobre el impresionante río Mekong y experimente la belleza de las antiguas ruinas en esta excursión adaptada para satisfacer sus necesidades e intereses. El traslado de ida y vuelta al hotel está incluido en esta experiencia única. We came to Chiang Saen by river boat and did not realise that the cruise company was to take us to the Opium Museum and Golden Triangle before taking us to Chiang Rai. The tour we booked also included these on the itinerary. We explained this to the guide and after calling the company he revised the tour itinerary and instead visited the Akha tribe, Mae Salong and the tea plantations. We were very grateful that they were so flexible and the guide, Alex, was excellent as was the driver. We had a good day out. - We only saw the Longneck tribe because we’ve specifically asked for it during the tour. Otherwise, we would only see 2 tribes and intendo them was just for tourists. Disappointing. We only visited two Hill Tribes which were right next to each other. Museum was very interesting. From the moment we were picked up to the moment we were dropped off we were flooded with information, facts, stories and history. Our guide Suda was terrific. She was extremely outgoing, fun and super knowledgable. 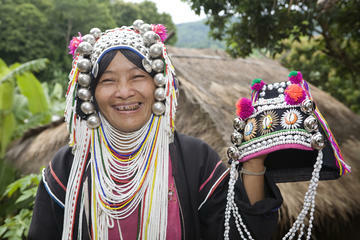 She made our time spent with the hill tribes so intimate, it felt as though we were a part of their family. We even got to go inside one of their houses! We were able to ask her so many questions, getting honest answers. The only unfortunate part of the trip was the lunch. The food was not good, and catered to Western tourists. We would have loved real local spicy Thai food! But the rest of the day made up for it entirely.